A court has heard that two men on trial accused of attempted murder were overheard by police discussing a knife attack through a flat intercom. Matthew Boyle, 42, and Kevin Deans, 40, are on trial at the High Court in Aberdeen accused of a string of charges, which include attempting to murder three members of an Inverness family. John, 64, Sylvia, 55, and Charlie, 30, Gallagher were all left with life-threatening injuries after they were stabbed outside the city’s Broadsword bar following a charity event on August 29 last year. Boyle and Deans deny the allegations against them and Boyle has lodged a special defence of self defence. 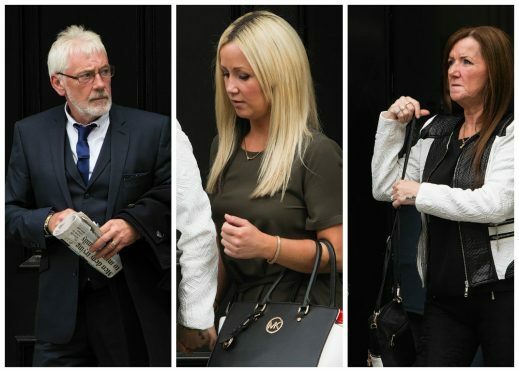 Yesterday, the court heard that following the incident at the bar in Aberdeen’s Tillydrone area police who went to the scene were given the names of the two accused. Officers were then sent to stand guard outside Boyle’s address in the city’s Portal Crescent. Jurors were told that when they arrived there they could hear “faint voices” coming from inside the building. Giving evidence during the third day of the trial, Constable Derek Mckay said he was ordered to attend the pub in Hayton Road after receiving reports of a triple stabbing. He said witnesses at the scene had recognised the two people they thought were responsible for the attack. Constable Mckay and three other officers went to monitor the men at Boyle’s home. He said that when he arrived he could see only one light on in the building, which appeared to be at Boyle’s house. He said he was then able to hear what he initially thought was voices through an open widow, but on closer inspection appeared to be a discussion being broadcast through the intercom system. He said he heard a man, who he later identified as Boyle, make a series of comments which included “she deserved what she got”, “all I know is that she attacked me”, “you’re going to get lifted and I’m going to get lifted”, “aye the fella got stabbed” and the repeated mention of the words “Stanley blade”. Constable Mckay said he also heard the pair discussing CCTV on the street and mention of Boyle “trying to defend himself”. The court heard Constable Mckay and his sergeant Allan Masson both had to press their ears up to the intercom system to hear the conversation, which they listened to for more than an hour. The officers then recorded what they had heard in Constable Mckay’s note book.